Unlike conventional TENS machines, which generate relatively large electric currents to swamp nerve signals and override pain on its way to pain centre in the brain, the Micro-Z II TENS Machine uses low pulsed Direct Currents, which are more akin to the natural electric activities within the muscle and nerves of the human body. Delivering deeply penetrating Direct Current directly to the centre of pain means that the treatments with the Micro-Z II TENS are more effective and regenerating, when compared with the standard TENS machines. Direct Currents are deep but gentle and not felt during treatments. B-CURE Laser relieves pain, reduces inflammation, accelerates natural healing processes and rejuvenates skin and tissues. Easy to use, effective and safe, the B-CURE Laser is suitable for treatment of acute and chronic problems. 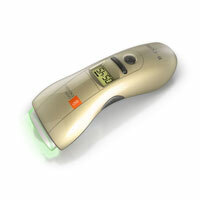 Light and compact and safe to use at home and during travel, the B-CURE Soft Laser is suitable for all the family - for chronic pain of arthritis in mature people, for difficult to heal leg ulcers and bedsores in elderly people and for speedy resolve of acute pain caused by sports injuries in younger people. Now you can heal your wounds and relieve your pain speedily with the B-CURE Laser! 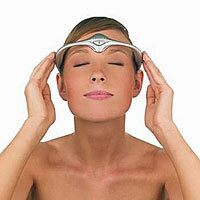 Cefaly Migraine Cranial TENS fights Migraines, Headaches and Stress. Cefaly is a novel patented medical device supported by numerous clinical studies and safety tests as well as thousands of testimonials from a growing number of satisfied users. Cefaly is effective and safe and complies with stringent requirements of the European Medical Devices Directive. Easy to use and worn on a forehead during treatment applications, Cefaly Migraine Cranial TENS strikes migraine pain effectively, reduces discomfort of troublesome headaches and relieves tensions caused by stress. SunIce delivers thermotherapy and cryotherapy in one handheld portable device. SunIce gives you the power to apply soothing heat therapy just seconds apart from calming cold therapy - as you need and when you need! Just select the treatment option - hot or cold - and apply the treatment directly, where relief is needed. Quick, effective, safe and easy to use, the SunIce Thermotherapy and Cryotherapy Device is an innovative answer to all your hot and cold therapy needs. In addition to soothing pain relief therapy, the SunIce can also be used as a beauty device that cools or heats your skin during beauty treatments. 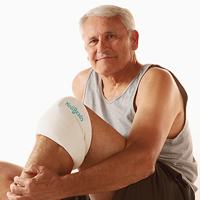 Bruder Moist Heat Joint Wrap with patented MediBeads delivers moist heat treatment for soothing pain relief. Bruder Moist Heat Joint Wrap provides a proven natural pain relief that is effective, safe, drug free, non-addictive and non-habit forming. Moist Heat can help you fight your chronic joint pain and is perfect for painful knees. Heated in a microwave for a few minutes, Bruder Moist Heat Joint Wrap can be applied as frequently as needed. Moist heat penetrates deeply and soothes pain at its source. The Bruder Joint Wrap does not require addition of water -just heat in a microwave for moist natural relief! Handy Cure Laser is a therapeutic soft laser for home use. It delivers combination therapy comprising of the low level pulsed infrared laser therapy, visible red light therapy and static magnetic field therapy from one compact hand held laser. Handy Cure Laser produces speedy therapeutic outcomes due to the combined action of integrated therapies. Handy Cure Laser reduces pain and is especially effective in conditions presenting with poor micro-circulation and poor tissue oxygenation. Effective, safe, simple to use and affordable, the Handy Cure Laser paves the way to discomfort free life. Much has been written about potentially life threatening adverse effects linked to a number of pain killers pain relieving pharmacological drugs (i.e. pain killing medication = pain killer). It is not surprising therefore, that many people who suffer chronic pain and prolonged discomfort are turning to non pharmacological alternatives for pain relief. Electrotherapy devices can be as effective in pain relief as medication, however, pain relief with electrotherapy carries an extra bonus of being free of drug related side effects. Most commonly used electrotherapy devices for pain relief are Tens machines, interferential therapy machines and and phototherapy lasers. Drug free pain relief can be achieved in many different ways. Alternative therapy practitioners, such as osteopaths, chiropractors and physiotherapists can offer valuable and specialised advice to people wishing to reduce their intake of painkillers. Often simple methods, such as application of heat or warmth can be effective and helpful. However, please note that experts advise that people do not stop pain relieving medication without a prior consultation with their doctor. In this section of our website we present a number of different ways to address pain effectively and safely and entirely without medication utilising a number of different methods of electrotherapy. Applications of electrotherapy treatments are simple and treatments are effective and safe. Electrotherapy devices specific to each electrotherapy method are medical devices that are appropriately tested and certified as well as proven. 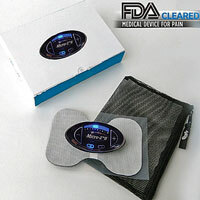 Find more information about pain relief with electrotherapy devices in individual respective sections. Simply follow the links above.